In between these sweet, sweet video shots of jets in the video above, you’ll find some wisdom about why it’s so important that astronauts climb into these planes for training. Turns out that flying has a lot to do with preparing for very quick-changing situations in spaceflight — whether it’s in a cockpit or in a spacesuit. “Psychologically, being in an aircraft is very similar to being in a rocket because you are dependent on this machinery,” says astronaut David Saint-Jacques in this new Canadian Space Agency video. Saint-Jacques and fellow Canadian Jeremy Hansen took part in this video to mark the 110th anniversary of the Wright brothers’ first powered flight, which took place Dec. 17, 1903. And there’s more to this video than jets — you can see astronauts participating in spacewalks and also the ongoing European Space Agency CAVES expedition series in Sardinia, Italy. There’s even a quick glimpse of the Snowbirds, a famous military flying demonstration team in Canada (which Hansen flew with earlier this year). For more information on the T-38s used for astronaut training, check out this NASA link. 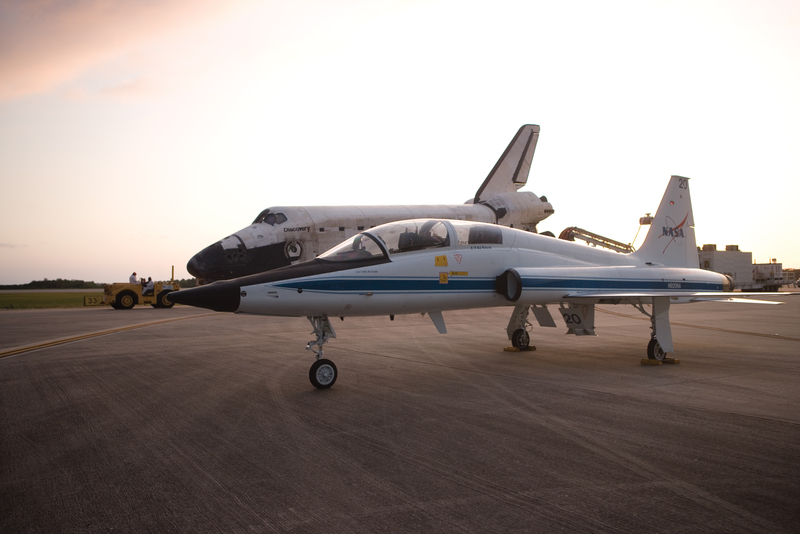 A T-38 plane parked in front of space shuttle Discovery in this undated photo taken by NASA astronaut Story Musgrave, who flew six times in space in the 1980s and 1990s.